My Survey- Earn Cash & rewards by filing out surveys and testing products!!! If you are looking for a Survey company to join to make a few extra bucks, check out My Survey. They also send products that you get to keep (for FREE) and e-mail notification about surveys for you to do. Sign ups end today June 30 so sign up while you can, I have no idea when they will open up sign ups again. 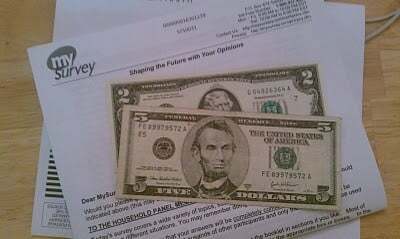 As you can see below they send out CASH along with their surveys so you get paid upfront!!! How awesome is that!